Your thoughts and comments about our practice are invaluable to us in our ongoing mission to provide the very best periodontal care. To create a review, click one or more of the applications seen below. You will be directed to our site on that given application where you can add to the reviews already listed there. The consistency of excellent services is remarkable. Always warmly welcomed and all procedures are clearly explained! Impressive communication with my other dental care providers. I have been a satisfied customer for over 22 years. This was a very pleasant experience. I had an urgent issue and they took me right away. I have had one procedure so far. Very happy with the outcome. Everyone in the office is professional and nice. Dr. Snyder is caring and very experienced. I would recommend them to everyone. Dr Snyder is the best medical professional I have experienced. The office is like no medical office I’ve ever been in. It’s just beautiful. Its clear that they want you to be as comfortable as possible. Its TVs on the ceiling to watch as your procedure gets done. If your cold they’ll give you a blanket. Dr Snyder calls you after your procedure to check on you. I’m also in the military so he gets payed less to work on me but I get the same top notch service as everyone else. Awesome! Went to this practice with a friend to sit with her while she had dental surgery. I had a chance to spend two hours in the waiting room admiring the beauty ,the staff and reading several interesting magazines. I didn’t want to leave. The staff was so professional and very attentive made me feel like part of their family . I wish I had Periodontal problems so I could sit back in that beautiful office again! The place has genuine people working there and truly care about their customers and in my case not a customer…5 stars. Great place! Supports members of the military and gives excellent service. Everyone was super nice and they even contacted me the night of my procedure to make sure I was ok. Would definitely recommend this place to anyone looking for a periodontist. 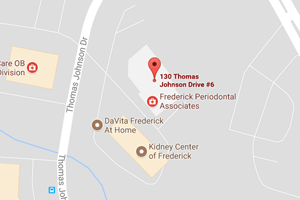 Thank you for visiting Frederick Periodontal Associates! Please take a brief moment and leave us a review. We would love to hear about your experience.